In this vivid new interpretation of Genesis, former Episcopal priest John R. Coats looks at the ancient text and its characters in a new light, as stories about people whose day-to-day concerns, triumphs, and failures are not unlike our own. 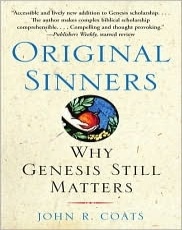 In fact, understanding the people and stories of Genesis can help you understand your own life, family, and colleagues. In the relationships of Cain and Abel, Jacob and Esau, Rachel and Leah, and Joseph and his brothers, for instance, you can see an all too familiar escalation of the toxic sibling or even workplace rivalries that tear at the fabric of contemporary life. And in Abraham's ponderous response to the command to "Go forth," and Noah's unquestioning commitment to build the ark, you can revisit the question of your own life's path -- your calling. In Original Sinners, these characters take on stunning contemporary relevance as they find themselves confronted with extraordinary situations and circumstances that they'd neither asked for nor had anything to say about. Using stories from his life as well as the lives of people he's known, Coats creates a model that can be used to examine your own life and discover aspects of yourself in the characters whose lives unfold in these primordial stories. Weaving together biblical scholarship from many traditions with his own reflections on modern life experiences, Coats explores the character strengths and weaknesses of the men and women in Genesis (and of his own character), revealed through their handling of ordinary matters of life and death as well as in their encounters with the divine.